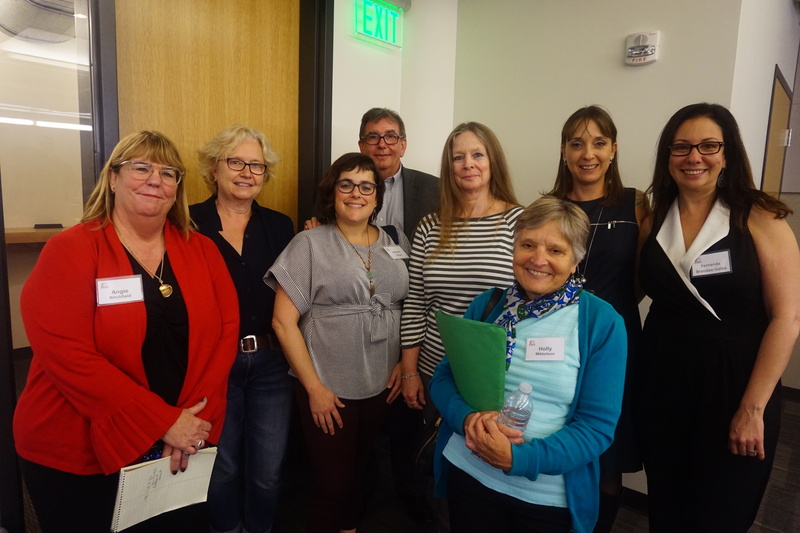 For the September General Meeting, NCTA brought together a panel of high-level interpreters: Angie Birchfield, Johanna Parker, Holly Mikkelson, Andrea Hofmann-Miller, Robert Finnegan, and panel moderator Olivia Reinshagen-Hernandez. The topic discussed was a very important one for interpreters and translators: interpreter–client privilege, or our right to remain silent. With the Global Climate Action Summit just a few days away, a crowd was protesting on the streets of San Francisco—and the big names on our panel brought a crowd of our own to the NCTA meeting, including a group of interpreting students from the Middlebury Institute of International Studies who had driven up from Monterey. Panelists Andrea Hofmann-Miller and Holly Mikkelson. To open the discussion, Holly Mikkelson read aloud from the International Association of Conference Interpreters (AIIC) Code of Professional Ethics, which states: “Members of the Association shall be bound by the strictest secrecy, which must be observed towards all persons and with regard to all information disclosed in the course of the practice of the profession at any gathering not open to the public.” Subpoenaing a statesman’s interpreter to divulge information about a private meeting would force the interpreter to violate this guideline. 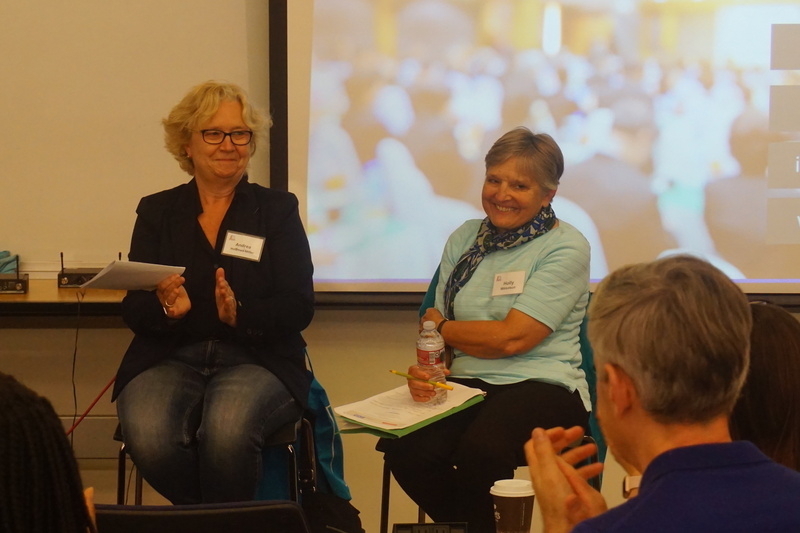 Other panelists noted that there is not much room for discussion when the subject is client–attorney or physician–patient confidentiality; why should this be different for interpreters? Almost all of the panelists raised the issue of public perception of interpreters: as long as we are not recognized as a profession, our perspective will continue to be overlooked. It is true that we don’t look like other professions: many of us start in the field by chance, but I think that is the beauty of it. We fall in love with this fascinating field, bridging gaps in language and culture and helping people communicate in the hope to make this world a better place. We follow the opposite route of other professions: we start our careers before getting a degree. Nevertheless, we are all professionals, like lawyers, physicians, engineers, teachers, and nurses. We translate and interpret a vast array of documents, meetings, hearings, and conferences, and all these should be treated as strictly confidential. So, what can we do to protect ourselves? For one, it is essential to correct the common misunderstanding of an interpreter’s role in an encounter: an interpreter is not part of the encounter, but rather the means of communication. Above all, we must educate clients and be the champions of our profession. We are blessed with countless opportunities for professional improvement. Distance learning is here to stay, bringing knowledge to us wherever we are. Social media can play an important role in teaching the public about what we do and the importance of the services we provide. Certification and professional associations are of paramount importance, so we can fight for better standards and the recognition we all deserve. We would like to express our heartfelt thanks to Olivia for accepting the invitation to moderate the panel, and to Angie, Johanna, Holly, Andrea, and Robert—some of whom came from far away—for taking the time and sharing your knowledge and wisdom with us. It was a great honor having you all. translorial posted this article under Ethics, Interpretation, NCTA Events, NCTA Meetings, Reports, Reviews	on Wednesday, October 17th, 2018 at 3:35 pm	You can follow any responses to this entry through the RSS 2.0 feed. You can leave a comment or trackback from your own site.